HSS Cellular Intercept Systems can capture Forward and Reverse cellular channels during a cell phone call. Using this means of communications intelligence helps improve information gathering. This feature can also help confirm details about the target, possible accomplice activity, and help Law Enforcement move quickly against criminals, terrorists, or suspected felons. HSS Cellular Intercept Systems can capture the signals of the Control Channel frequencies, aiding in the ability to monitor the call as it moves between the base station points and cellular antenna sites. In cellular communications, the Control Channels represent the frequencies used to communicate with the cellular network to prevent calls from getting dropped. When cellular phone conversations take place, cell phone handsets send and receive radio signals to and from cellular antenna towers. The path these radio signals travel in is characterized as a multi-directional flow pattern. For Interception, the flow encompasses forward and reverse directions. These directions classify the flow of signals traveling over channels, called forward and reverse channels. The Forward channels manage the movement of signals from the cellular towers to the cellular phone handsets. 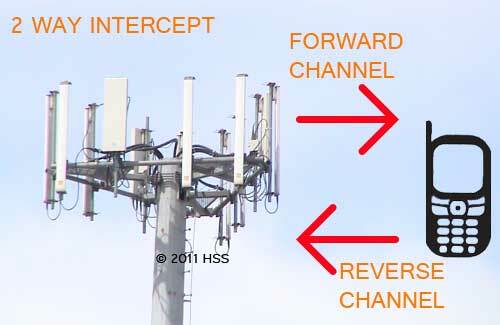 The Reverse Channels manage the movement of signals from the cellular phone handsets to the cellular towers. The towers, in turn, connect with the service provider, routing the call from or to the cellular phone handset. In order to keep track of the target’s communication, and prevent a loss of the signals carrying the communication, there needs to be a synchronous monitoring of the Control Channel activity. Without this lock on the target, the communications intelligence could be disconnected once the channel carrying the communication signals change.